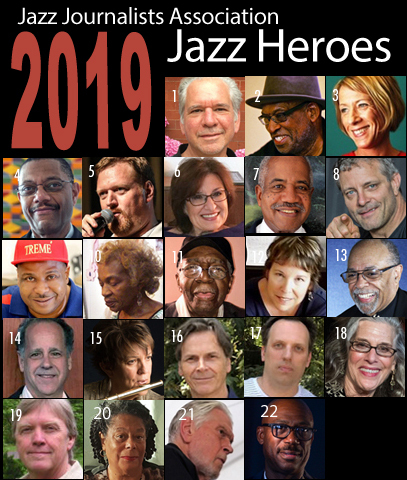 The Jazz Journalists Association, a nonprofit professional organization of writers, photographers, videographers and broadcasters covering jazz, established its Jazz Heroes campaign in 2010, having since 2001 called the honorees members of the JJA "A Team." The JJA presents annual Jazz Awards for excellence in music and music journalism; nominees for 2019 Jazz Awards will be announced mid-April, with winners of those Awards revealed on or about May 1. 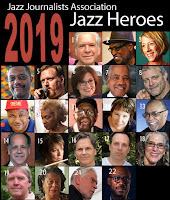 Entities collaborating on 2019 Jazz Heroes presentations include B Sharps Jazz Club, the Biamp PDX Jazz Festival and Jack London Revue, the Carr Center, the Hyde Park Jazz Society, the California Jazz Foundation, MCGJazz, JazzPolice.com and Westminster Presbyterian Church. North Coast Brewing Company is beverage sponsor of the JJA Jazz Heroes campaign.